Sedona has been home to Luminous for the past 26 years—16 of those years spent in the real estate profession. She is a consistent top producing Broker/Owner of Luminous Realty, the only luxury boutique brokerage serving Sedona, Arizona and surrounding areas. She is also a member of the Phoenix/Scottsdale Board of Realtors serving greater Phoenix, Scottsdale and Paradise Valley. 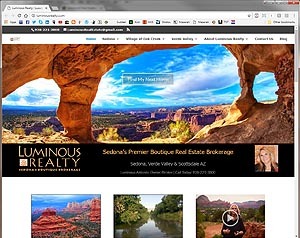 Sedona Luxury Real Estate Professionals (10 years): Luminous is President Elect of a group of approximately 25 realtors responsible for the sale of 64% of the luxury homes in Sedona in 2014. SLREP members aspire to a higher level of education about home construction, materials and finishes, system and appliances, design trends and other details significant to function, value and desirability of luxury properties. Certified Luxury Home Marketing Specialist (10 Years): Recognized as the mark of accomplishment in luxury markets around the world, the Certified Luxury Home Marketing Specialist (CLHMS) designation assures affluent buyers and sellers that the agents who have earned it have the knowledge, experience, competence, and confidence they require. Certified International Property Specialist: Only 0.1% of the estimated two million licensed realtors in the USA earn this certification. Foreign nations account for an ever growing percentage of buyers in the USA market and understanding international cultures and their ways of doing business is critical to the success of a transaction. Master Certified Negotiation Expert: Considerable effort and time involved in learning the negotiation skills MBA graduates of Harvard Business School learn – tailored by the Real Estate Negotiation Institute for the real estate business. Luminous is happy to take the time to introduce buyers to the area and share information that supports educated choices. She attended the New School for Social Research and Pratt in New York studying psychology, philosophy comparative religions and graduated from the San Francisco Art Institute with degrees in Painting and Performance/Video. Her background in Fine Arts, Antiquities and Interior Design adds dimension to her understanding of the luxury market.